Which Supercharged Mustang Is For You: A 2014 Shelby Or A 2015 Roush? While we're waiting for the new Mustang GT350 to come out, it's worth noting that Roush is ready with its supercharger kit for 2015 Mustang GT, but Shelby's 2014 GT/SC is not a bad package either. It all depends on what you're after apart from a massive performance increase and lots of tire smoke, because those come as standard with both tuned Mustangs. Shelby's GT/SC is based on the current car, has 624 horsepower, a short shifter, stiffer springs, Wilwood brakes a full Eibach coil over suspension, lighter wheels and a mean exhaust system. 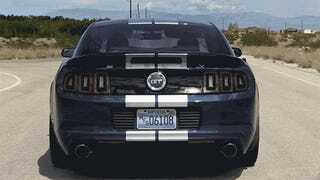 It also has a revised exterior with a new grill, bumper, hood and Shelby's signature touch, the wide racing stripes. The 2014 GT might be a bit cheap on the inside, but it's also better value overall and the last of its kind being designed entirely for the US market. The 2015 car is much nicer on the inside to begin with, independent rear suspension is a given and Roush also gave it 600+ supercharged horsepower, with a limited warranty available through Roush Performance retail channels and Ford Racing distributors. It all comes down to whether you're an early adapter or a fan of refined final runs. Either way, burnouts will happen.